I’m looking forward to the holiday season this year. Though I live in Miami and it sure doesn’t feel like Fall has arrived yet, I’ve already started decorating to kick off the holiday spirit. Things always feel more festive when you decorate, don’t you think? One of the things I really enjoy during the holiday season is swapping cards and letters. If you know me, you know I love to write the old-fashioned way. I adore writing utensils, especially colored pens, and pretty paper and cardstock – must be from growing up surrounded by people in the printing industry. I’ve been a big fan of Shutterfly for some time now and their photo cards are some of my favorites. This year I’m lucky enough to get 50 free cards and share my love of their products with you! If you’re a blogger and you’d like a chance to win 25 free cards this holiday season then be sure to register for 25 Free Christmas Cards from Shutterfly. 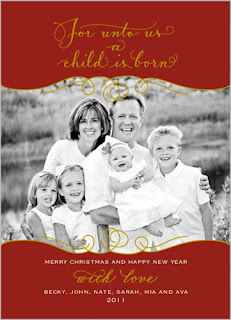 Speaking of selections, I’m not sure what style of Christmas cards I’ll pick or even what photos I’m going to use yet. I better get on the ball, huh? Any suggestions? Let me know! I’ve got 3 promo codes to share with my readers, each for 25 free cards. Drop me a comment between now and Monday, 10/31 at midnight est. and I’ll enter your name in my drawing. Winners will be announced Monday, 11/07 so be sure to check back! If your name is announced and I don’t hear back from you within two days, I’ll pick another name from the hat. Count me in! I ♥♥♥ Christmas cards! Great to know! I love Shutterfly too. I have made a few photo books with them. SO Glad I got to met you! Glad we can be fellow “pink bloggers” XXO! I am in too….Great Idea…good luck to everyone.